per·fect/ˈpərfikt/ Having all the required or desirable elements, qualities, or characteristics; as good as it is possible to be. The design (and the company) is everything I want in the world. SWEETS AND AMPERSANDS. The day I met Dough & Batter on the interwebs, it was like the first time PB met J, macaroni met cheese or rice met beans... I went though every emotion... I fell in love. I laughed. I cried. I got angry. I got ecstatic again. If I could find a perfect match, a soul mate, a BFF (and a perfect post for 128johnst. ), this was it (and damn do I wish I was the one who thought of it). Hyun Auh is a graphic designer based in NY who specializes in brand identity and all things printed. 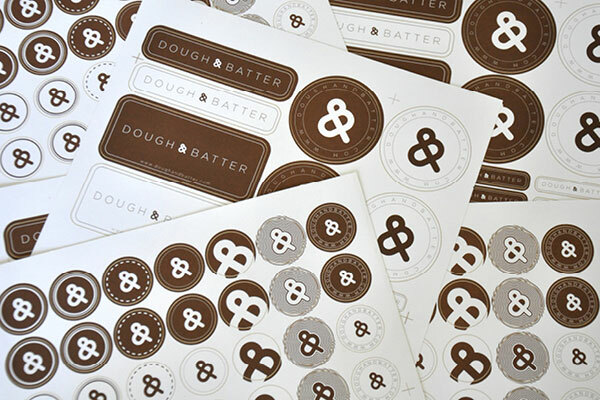 He is heavily influenced by the adage "less is more" and a passion for typography which he illustrated so perfectly in the branding he designed for Melissa of Dough & Batter. Have I ever mentioned that I want to name my first child Ampersand?! Truth. I ain't lying. Hyun says, "The initials of the name are combined to create a puffy ampersand that resembles a rising dough. The custom ampersand can be used alone or integrated within the logotype." So. Damn. Good. Shiz. If you all knew me (many of you probably do, hey friends!) you could begin to understand why this is one of the most beautiful things that could possibly exist in my world (and why I am so rage that I didn't design it!). Not only am I completely enamored by the design, the sweets on Melissa's website look amazing as well. I am particularly obsessed with the cookie- wedding cakes! Holy smokes, are they adorable and look delicious! I'm crazy excited to get my hands on some sweets from Melissa of Dough & Batter and tell you all about them! If they are half as tasty as the images make them look, I am quite positively-positive they will be the best I've ever had .